In-line Duct Fans | S&P Canada Ventilation Products, Inc. 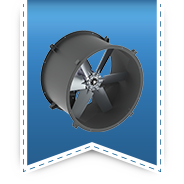 The TD-SILENT fans are extremely quiet, low profile fans manufactured in tough reinforced plastic material. Sound waves are directed through the perforated inner skin and absorbed by a layer of sound-absorbent insulation. These fans are fitted with rubber gaskets on the inlet and outlet to facilitate installation, absorb vibrations, and provide a virtually air-tight seal. The POWERVENT (PV) series of direct drive centrifugal in-line duct ventilation fans consists of twelve model sizes 4", 5", 6", 8", 10" and 12.4" respectively. 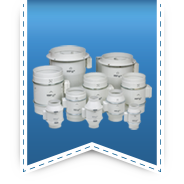 All models are designed for direct connection in-line with standard diameter round ducting. Airflow performance values range from 108 CFM (PV-100) up to 942 CFM (PV-315x). 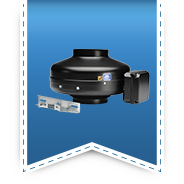 PRF-Radon Mitigation fans are specifically designed for radon mitigation. 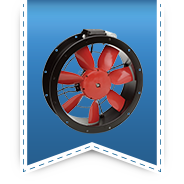 The fully-sealed plastic fans feature backward inclined centrifugal blower/motors capable of handling up to 1" of static pressure. 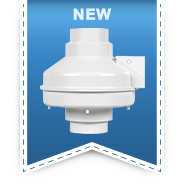 The PRF series has duct lips sized for easy fit with standard PVC couplings typically used in radon mitigation applications. 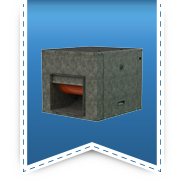 Additionally the PRF was engineered with large, easily accessible, watertight electrical boxes for unobstructed wiring process. 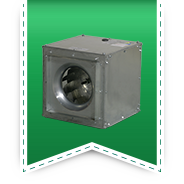 SQB square in-line duct mounted fans are available in sizes 7 through 42, moving from 100 to over 24,000 CFM, with high static pressure capability up to 3-1/2". SQB units are the perfect selection for clean air applications where space is a leading consideration. The compact housing with removable access doors and side discharge can be mounted in any orientation. AMCA licensed performance and UL listing assure that you've made a reliable selection. The SQD square inline duct mounted fan is available in sizes 6 through 15, moving up to 2,800 CFM, with static pressure capability up to 1". eSQD electronically commutated square inline duct mounted fan is available in sizes 8, 10, and 12. 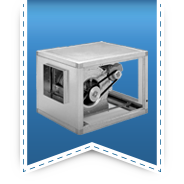 SQD units are the perfect selection for clean air applications where space is a leading consideration. The compact housing with removable access doors and side discharge capability can be mounted in any orientation. Inline Tubular Centrifugal line offers one of the widest ranges of sizes, horsepower and performance in the industry. Models CTB are high capacity belt drive tubular centrifugal fans rated from 300 to 20,000 CFM, with static pressure capability up to 2-1/2". 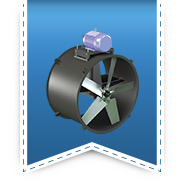 These fans are designed for commercial and industrial in-line applications that demand quiet, efficient and reliable air movement. They are used to exhaust air from or supply air to commercial and industrial applications, such as, general building ventilation, enclosed garages, paint spray booths, heat and smoke ventilation systems, restaurant and kitchen exhaust ventilation, historical buildings with limited roof space and restrictive duct lengths, and other applications where air is moved through a duct system against moderate static pressure. Forward Curved Belt Driven Inline Duct Blowers is designed for supply, exhaust or duct return applications. The CFD is an economical fan model designed to run quietly and efficiently in cooling, heating, and ventilating applications. CVTT, with our standard features, is the Quietest forward curved cabinet fan in its category. The CVTT range of belt-drive double inlet centrifugal cabinet fans consists of 10 nominal product sizes with motor powers ranging from 0.18 up to 15.0kW. Airflow performances range from 500 to 42,000 m3/hr, with static pressures capability up to 600mm w.g. The CVTT series can be supplied suitable for either horizontal (H) air discharge depending upon the requirements of the installation. In addition to special order, the units can be supplied with circular inlet and discharge duct connection flanges (rectangular supplied as standard). The CVTT range of fans offer a very flexible supply or exhaust air ventilation solution to many applications, including the ventilation of factory units, offices, restaurants and commercial kitchens. 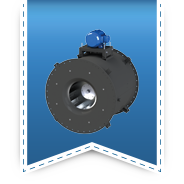 The COMPACT Duct Axial Fans feature an extremely compact design created by the combination of an external rotor motor matched with a direct drive wrap around an impeller hub. This very low profile design optimizes airflow performance while minimizing noise generation. DA's are designed to be installed in-line with inducted or partially ducted ventilation systems for exhaust or supply air applications. The Tubeaxial line offers the widest range of sizes, horsepower and performance in the industry. TDB's are high capacity belt drive tubeaxial fans rated from 900 to 75,490 CFM, with static pressure capability up to 1-1/2". 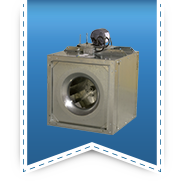 They are used to exhaust air from or supply air to commercial and industrial applications, such as, general building ventilation, enclosed garages, paint spray booths, heat and smoke ventilation systems and other applications where air is moved through a duct system against moderate static pressure. The Tubeaxial line offers the widest range of sizes, horsepower, and performance in the industry. TDD's are high capacity tubeaxial fans rated from 643 to 39,194 CFM, with static pressure capability up to 1-1/4". 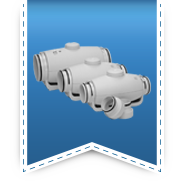 They are used to exhaust air from or supply air to commercial and industrial applications, such as general building ventilation, enclosed garages, and other applications where the air is moved through a duct system against moderate static pressure.